Split group in two teams. Each team sends two people at a time. 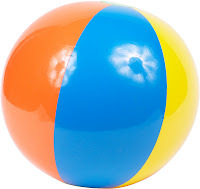 The couples lock arms back to back and hold a beach ball between them. They try to get around a cone and back without dropping the ball.